When it comes to home security camera’s Nest is the one to beat. With good looks, quick and easy setup, 24×7 live streaming, and a great app to boot, the Nest Indoor Cam is definitely the one to go for if you can afford it. 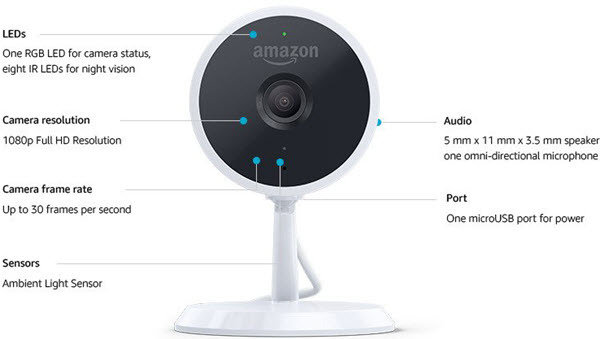 Amazon’s recent entry into the home security camera market brings a more affordable home security camera option for consumers:- Amazon Cloud Cam. The Amazon Cloud Cam is a lightweight camera with an all plastic build. Although that does make the device slightly less classy looking than the Nest Cam, it is by no means a flimsy device. Cloud Cam comes with a 70 mm-wide sturdy base with rubberized footing. The camera itself sits on a flexible ball pivot that rotates 360 degrees. You can either place the camera on a shelf or mount it to the wall or ceiling. The mounting kit comes included in the box. This is not a waterproof device so its better off indoors than outdoors. Setting up the Amazon Cloud Cam requires no professional help. You simply place the device on a flat surface or mount it on a wall. You can rotate the Live View 180 degrees to support ceiling mounting. Then download the Cloud Cam app and pair it using the instructions on the app. Plug the Cloud Cam into the wall, download the app and follow the pairing instructions. The LED above the camera flashes blue on startup and will turn into a pulsating blue/green color in pairing mode. When you hear a chime, the camera is ready to get configured. Just hit the setup button on your phone and in under 5 minutes, it will start working. Once you’ve set up the camera, you can see a live feed of the scene. You can also see video clips that the camera captures when it detects movements. Every time a motion is detected, you will receive a text notification on your phone and you can tap on the notification to watch the video clip of the activity captured. The Cloud Cam App also supports sound and vibration notifications and all alerts are completely customizable. The app also includes options to turn On or Off the night vision LEDs, audio playback, audio streaming and recording. 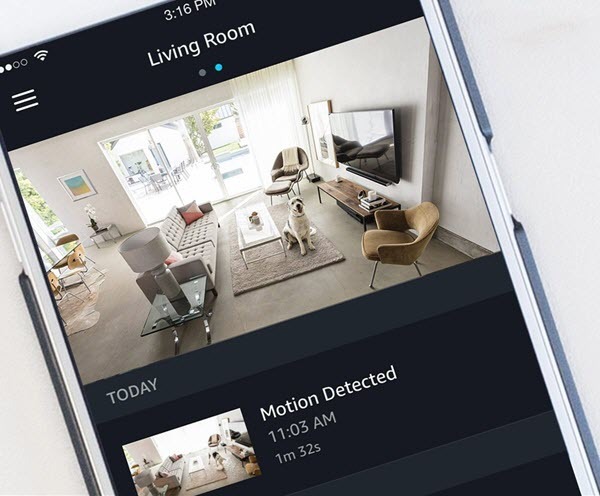 If you install multiple cameras in your house, you can name each camera (e.g Kitchen,Living Room) so you know which camera views you want to monitor. The 2 way audio lets you check in on family members, say your kids when they are in another room in the house. Since Amazon Cloud Cam works with Alexa, you can ask Alexa to show Cloud Cam’s live view on a Fire TV, Fire Tablet or Echo Show, or Echo Spot. The camera also has geofencing, a feature that deactivates the camera when it knows you are home or switches it on when you leave. When it comes to data storage, in the free storage plan, you cannot access data older than 24 hours. However, you can still download video clips from your Amazon Cloud Drive account and view them on your PC. Look for the download icon in the top right hand corner of the videos page. If you subscribe to one of the Cloud Cam plans you can enjoy advanced features like person detection. So if the camera sees a person, you will get instantly notified. You can also set Zones to avoid unwanted alerts and notifications. Zones are specific areas in your house that Cloud Cam will ignore, such as a fish tank. Cloud Cam subscriptions come up to 30 days of video history and support for up to 10 cameras. There are currently 3 paid Cloud Cam subscription plans. Extended Plan: 14 Days Cloud Storage; 5 Cameras supported; $9.99/month. Pro Plan: 30 Days Cloud Storage; 10 Cameras supported; $19.99/month. Now Amazon Cloud Cam can work as a standalone camera but it also works well as part of the Amazon Key in-home delivery service. Amazon Key is a Prime-only service that uses the smart lock and Amazon Cloud Cam integration to allow couriers to deliver your Amazon packages inside your home. You will need to purchase a cable separately to make this integration possible. So for those of you who prefer to have your Amazon couriers delivered inside your house when you are not there, with some additional costs, you can have the Cloud Cam setup working for you. The Amazon Cloud Cam only records video when there is motion. It does not allow you to manually record videos from your feed. And it does not record video 24×7. Also, if you plan on doing some discreet recording, this may not work for you since the blinking green LED light stays on when the camera is working. Also, the camera does not allow for panning and zooming. So if you’re looking for more hands-on control over your camera this may not be the one for you. For its first iteration, the Amazon Cloud Cam home security camera is a pretty solid device. It is affordable, performs well on most reviews, and has plenty of good features even on the Free plan. It is a big plus if you have an Amazon ecosystem at home as well. If you have very specific needs such as 24×7 video recording, manual control, local storage and such… well… you may have to look elsewhere but that means you’ll also have to shell out more money. For the most part, Amazon Cloud Cam does a fine balancing act offering enough for good home security for the price. Visit Amazon.com to learn more about the Cam. Apart from buying indoor security camera, you can also get some smart trash cans to enjoy a cleaner life.